In the NPH Haiti St. Helene clinic, we identified many children with skin conditions related mainly to the water, which then triggered medical services to begin an investigation. It has taken a great deal of effort from many people to improve the water conditions, including the drinking water in the home. 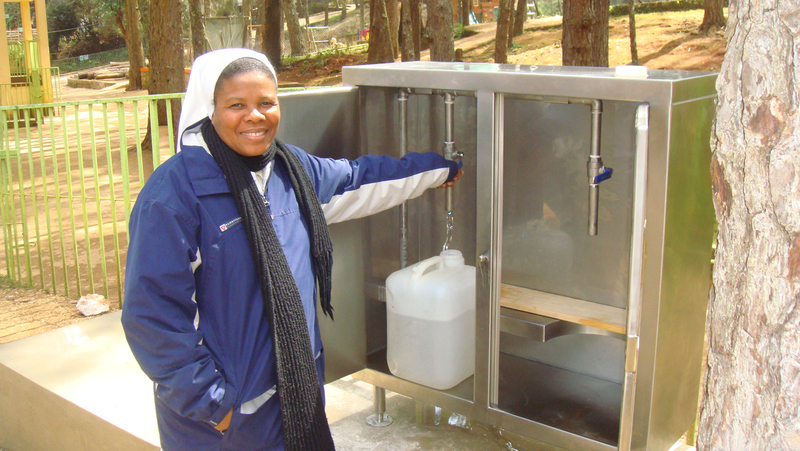 Sr. Bonite, House Director at St. Helene, fills up a water jug. Medical Services began working with the maintenance crew and directors in St. Helene, checking the filters, pipes and washing the deposits/cisterns as well as the water truck tank that provides water from the main deposit in town. It wasn’t until October 2012, when a solution started to take shape when an engineer from “Water is Right” came to Haiti for a month to do a full assessment of the situation. Along with the maintenance team of the home, long-time support Mr. Vern Conaway and engineer Renzo Seravalle from the Dominican Republic, came to Haiti to support and be part of the team. Now there are four 600 gallon tanks allocated strategically in order to treat the water. The water truck starts filling the first tank and the water gets treated along the way until the fourth tank dispenses water perfectly safe for the kitchen and school. The water purification process is through treatment with chlorine and UV light. The test results are even better than the established standards for bottled water! Parallel to this improvement, in January, a hydrologist from Austria , did a comprehensive assessment on water springs in the St Helene surroundings. The conclusion on the possibility of finding productive groundwater reservoir through drilling seems to be uncertain and costly, however there are several springs that provide sufficient quantities of clean water in the vicinity of the home, thus a possible scenario for feeding into this spring water. Nevertheless, the water would need to be lifted by a pump to an intermediate storage reservoir and a pipeline built to connect to St. Helene. Not an easy solution, but team work makes everything possible and could be considered in the future.